Subsonic Forum • View topic - seeing long titles? not really. classic mobile layout is very 'fixed size' for things like that - trying to get it to fit with the album cover in particular. I can only suggest maybe shrinking your phone's default font (unless you really need it that size). The android app hasn't been updated in a very long time, as there have been very few API changes that warrant it and it is pretty stable such that it is the baseline for several other android apps available. Since the first day of MP3 I hate this layout of the filenames. The early MP3 Player have had only 8 Letters but every XXXXXX was doing Artist-Title or Artist-Title-Track-Album and you have all the same 8 Letters on the screen. Since I have my Folder Structure Artist/Year - Album/CD if more/Tracks, I have changed every Piece of Music to Track. Title - Artist everything else is proper in the File Tags. 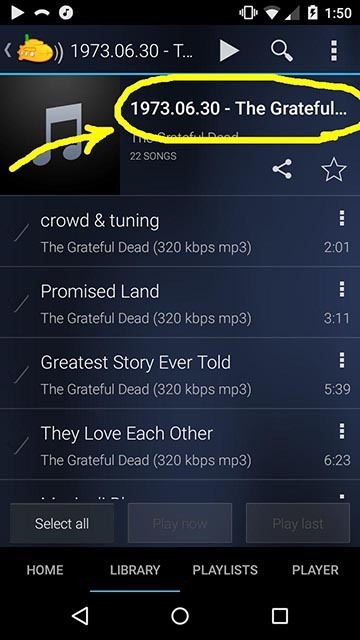 Try MP3Tag, it is free and imho the best available. In an blink of an eye you have changed the names or imported the Tags and covers from different services. There are also a couple of free subsonic clients, they are all not that quality of the iOS play:Sub or AVSub, last one is also streaming Videos, but try different ones to fit your needs. Well, I can say SubFire 2 Mobile is of no help here. I don't even bother showing the album/folder/playlist title on the pages once you've clicked it. I could, of course, but as noted, screen real estate is 'expensive'. I might rectify this someday but I still have some architecture pieces to finish for the 'desktop' player (which will support starring items, rating them 1-5, and playlist editing) before I can get to these kinds of aesthetics again. thanks all for replies! oh well! I know I've seen "scrolling" text elsewhere, only I can't recall where! maybe in future versions, they'll make the text scroll across the screen? WinAmp (XMMS was a clone for Linux) did that. I know an android music player I had at one point (I think the default for XTC's Evo back in the Android 2.x days) did as well. It would horizontally scroll one, then stop that at the beginning and move on to the next one. But they only did that while playing - not much help when the list space is narrow and the track name is long.